A taste of Cuba. 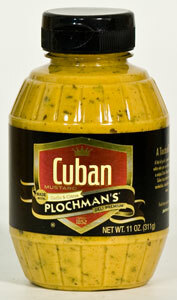 A hint of garlic, a touch of citrus and white wine give this mild yellow mustard a unique Cuban flavor. Use it to give Cuban inspiration to roast pork sandwiches, baked ham, chicken and more. Ingredients: Mild Yellow Mustard (white distilled vinegar and water, #1 grade mustard seed, salt, turmeric, onion powder, spices, natural flavoring), Water, Garlic, Orange Juice Concentrate, Sugar, Salt, White Wine, Spices, Chili Pepper, Cornstarch, Cilatnro, Lime Juice Concentrate, Lemon Peel, Onion Powder, Natural Flavors, Xanthan Gum.